We are engaged in the manufacture and supply of premium quality Sequential Marking Tapes. 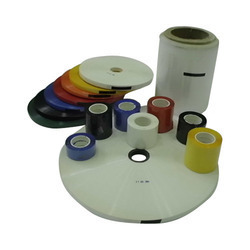 These Tapes are used for thermal transfer of meter length and other details on cables. These Tapes are processed under the proper guidance of our experts using good quality raw materials and latest technology. Known for their scratch resistance and easy application, these marking tapes are widely used for marking Wires and Cables, Pipes and other products for meter length marking. We are instrumental in the manufacturing, supplying and exporting of high quality Cable Making Sequential Tapes. These tapes are processed under proper guidance of qualified professionals using quality tested raw materials. Offered taps are globally appreciated among the clients for their attractive design, smooth finish and optimum bond adhesion. Looking for Cable Marking Sequential Tapes ?